“Schools are in the business of forking over the least money possible to get the most motivated kids and the most diversity,” she said. The onus is increasingly on parents “to think hard about what kind of dollars they are willing to fork over.” These days, it’s about the major: can the student get a job after college? Her rule: don’t borrow more than the student can expect to earn the first year after graduation. “If your child is going to major in computer science and is likely to do well at it, she can probably go [anywhere] and walk into a high-paying job,” she said, but the typical film studies major should keep debt to about $20,000. Parents at their wit’s end may find useful the Institute’s new report, “Student Debt and the Class of 2011.” It provides state-by state and institution-by-institution comparisons of tuition, room and board costs – and, as Monk’s report highlights, the critical information on the share of graduates with debt. The data are based on where the student attends college – not on where the student calls home. For example, the 10 states with the highest share of graduates in debt after attending four-year institutions in those states are: North Dakota (83 percent), New Hampshire (79 percent), Maine (78 percent), South Dakota (75 percent), Rhode Island (74 percent), Massachusetts (72 percent), Pennsylvania (71 percent), Minnesota (70 percent), Connecticut (69 percent), and Missouri (67 percent). 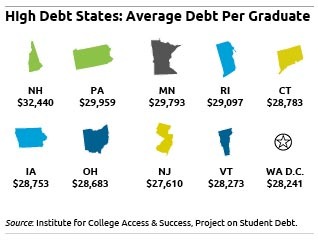 Most of the high-debt states are on the East Coast, followed by Midwestern schools. California, which has the most extensive public university system in the country, remains a low-debt state even as tuition increases there are becoming controversial. One high-debt state, Pennsylvania, has six of the 20 “high-debt” U.S. colleges: Indiana University of Pennsylvania, Pennsylvania State University, Temple University, LaSalle University, Robert Morris University, and Widener University. Here’s one way geography can matter. Colleges near home – often the default – are not always the lowest-cost option. For example, at the public or land-grant institution in your state, many people may be competing to get in that it may be difficult to qualify for any financial aid, college advisers say. On the East Coast, steep housing costs are a big factor: all eight of the highest-debt states have housing costs that exceed the national average, which raises the total cost of paying for college. Western states, where more students attend public universities, dominated the “low-debt states” in the report, including Utah, Hawaii, Arizona, Nevada, Oklahoma, Texas, Washington and California. The other low-debt states are Tennessee and North Carolina. Ivy League schools often have generous financial aid programs, and Princeton University and Yale University are among the “low-debt colleges” in the report. On the other hand, small, little-known colleges with fewer resources may saddle their students with more debt. College of Mount Saint Joseph in Ohio and Green Mountain College in Vermont are two examples of high-debt colleges. Schultz recommends that parents go online and compare a few colleges, using their website cost calculators. You’ll see big differences,” she said. Parents, what have you learned while researching colleges? To examine tuition and costs, by institution, click here. To download data by state, click here. For blog posts about student-debt prevention tactics, click here and here. The Institute, through its Project on Student Debt, also reported on net price calculators, which colleges participating in federal grant and loan programs are required to have. Here’s a report on the calculators, which were designed to help incoming students and parents get a better handle on the total cost of attendance. Briana Kan contributed to this article.